And just like that, the DROID RAZR by Motorola is official on Verizon. Pre-orders will start October 27 for $299 on contract with availability happening some time in November. It has all of the specs we have been talking about for weeks now including the 1.2GHz dual-core processor, 1GB RAM, 4G LTE, 4.3″ Super AMOLED “Advanced” display, and a whole bunch of built-in software. We just got done with the announcement event and will have photos and hopefully some video up shortly. Check out our live blog recap here in the mean time. 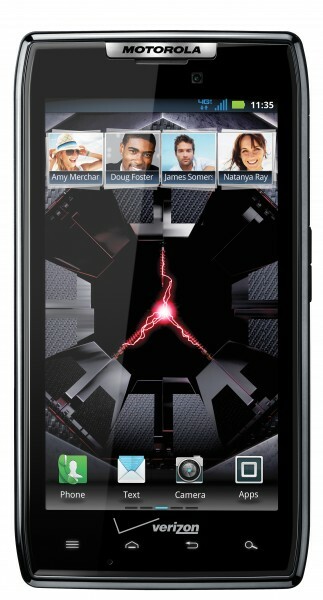 VERIZON WIRELESS AND MOTOROLA ANNOUNCE DROID RAZR™ BY MOTOROLA: DROID STRONG. RAZR SHARP. BASKING RIDGE, N.J., and LIBERTYVILLE, Ill. – Today, Motorola Mobility, Inc. (NYSE: MMI) and Verizon Wireless announced DROID RAZR™ by Motorola, the world’s thinnest 4G LTE smartphone. A true marvel of design, this smartphone packs strength and smarts into a stylish package offered exclusively from Verizon Wireless. Measuring 7.1 mm thin, made with KEVLAR® fiber for strength and Corning® Gorilla® Glass for scratch resistance, the DROID RAZR is ready to face the elements. Speed limits are just an illusion with a dual-core 1.2 GHz processor and Verizon Wireless 4G LTE. DROID RAZR customers can expect to rip through the Web with speeds up to 10 times faster than 3G. Not only does DROID RAZR by Motorola deliver heart-pounding speed, but it has a mind-bending 4.3-inch hyper-vibrant display with more colors than most LCD HDTVs. The Super AMOLED™ Advanced display with qHD resolution dishes out beautiful images and smooth action so on-the-go movies and TV shows aren’t a blur, whether customers stream from Netflix™ or rent from Android Market™. It’s the first smartphone capable of streaming movies and TV shows through Netflix with up to HD resolution. DROID RAZR customers can take advantage of the Super AMOLED Advanced display and 4G LTE speeds to stream videos with NFL Mobile, only from Verizon. Fans can stay up to date on news, schedules and scores from their favorite teams on the go. NFL Mobile is included at no additional charge for 4G LTE customers for the remainder of the 2011 season. If cutting-edge visuals are its beauty, apps on DROID RAZR are its brains. Enter MotoCast™, the free Motorola app that lets you stream or download your music, pictures and more from your PC to your phone. The Smart Actions app helps automate everyday tasks and optimizes battery efficiency by letting customers create rules, such as automatically setting the phone to vibrate during work hours or dimming the display at a specific battery level. The revolutionary webtop application allows customers to combine the device with separately sold accessories, like the Lapdock™ 100 or HD Station, unleashing the power to edit documents and browse the Web with a full Firefox® browser on a larger screen – all while charging the device. The DROID RAZR will be available in early November for $299.99 with a new two-year customer agreement at all Verizon Wireless Communications Stores and online at: www.verizonwireless.com; as well as at authorized retailers. Customers can visit www.droiddoes.com/droidrazr to pre-order DROID RAZR beginning on October 27. For more information on Verizon Wireless products and services, visit a Verizon Wireless Communications Store, call 1-800-2 JOIN IN or go to www.verizonwireless.com. Verizon Wireless operates the nation’s largest 4G LTE network and largest, most reliable 3G network. The company serves 106.3 million total wireless connections, including 89.7 million retail customers. Headquartered in Basking Ridge, N.J., with 83,000 employees nationwide, Verizon Wireless is a joint venture of Verizon Communications (NYSE, NASDAQ: VZ) and Vodafone (LSE, NASDAQ: VOD). For more information, visit www.verizonwireless.com. To preview and request broadcast-quality video footage and high-resolution stills of Verizon Wireless operations, log on to the Verizon Wireless Multimedia Library at www.verizonwireless.com/multimedia. Motorola Mobility, Inc. (NYSE:MMI) fuses innovative technology with human insights to create experiences that simplify, connect and enrich people’s lives. Our portfolio includes converged mobile devices such as smartphones and tablets; wireless accessories; end-to-end video and data delivery; and management solutions, including set-tops and data-access devices. For more information, visit motorola.com/mobility.